Are you looking for a great opportunity to put your money to work? There are several ways to make your money work hard for you. Buying a rental property or starting a business often come to mind. Plenty of successful people have built sustainable income streams by investing their money in real estate and/or by starting a business. My preference is to invest our extra income into quality dividend stocks. These stocks will soon pay us over $2,000 a year in extra income. It won’t be too long when they will pay us over $3,000 a year. Eventually (in many years), this income should help provide a sizeable portion of our income. In order to have our dividend income grow from $2,000 to $3,000 or higher, we must work for it. Sometimes that work may be a one-time upfront effort. Other times, it could mean activities like buying new stock every month. 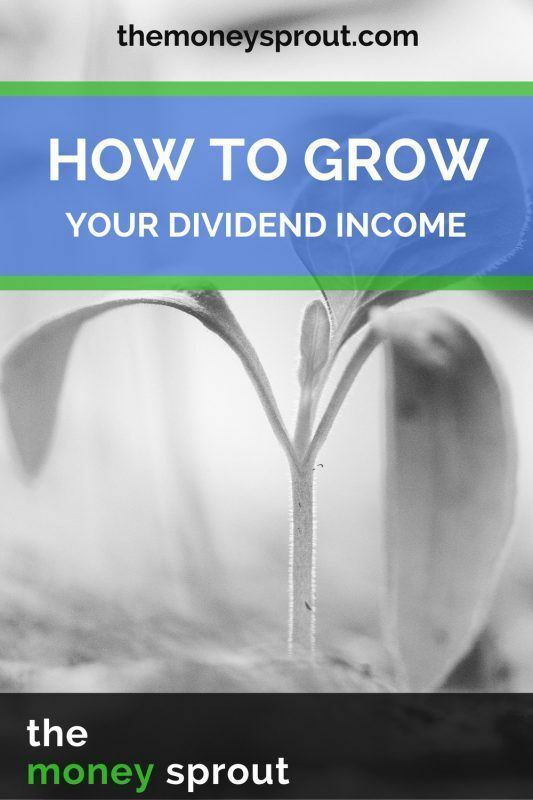 If you are interested in starting to invest for income, then you need to understand how to make your dividend income grow. Here are 3 ways in which you can grow your dividend income. If you know what you are doing when it comes to picking dividend stocks, you will be rewarded. The best companies that pay dividends almost always give you an annual raise. This is in the form of a yearly dividend increase that can often reach double digit gains. For example, last year I wrote about a 10% raise that Caterpillar (CAT) gave our portfolio from an increase in their dividend. Owning shares of Microsoft (MSFT) is another example of where we received a 16% raise last year in dividends. I should point out that companies don’t always give our annual raises from dividend increases. Caterpillar has maintained (not raised) their dividend for well over a year. Based on my dividend investment strategy, this stock is a “hold”. Microsoft on the other hand just gave us another 8% raise this year. Screening for companies that have a long history of raising dividends each year is a great way to grow your income. Successful income investors look for companies who have consistently raised their annual dividends for 10, 20, and even 25+ consecutive years! While the past performance of these companies does not guarantee future increases, it certainly is a good sign. So … if you want to grow your dividend income … the easiest way to do it is to invest in quality companies. Those companies that consistently raise dividends year after year after year. Dividend increases is about as close as you can get to true passive income! The second way you can grow dividend income is by reinvesting your dividends. After annual dividend increases, this is the easiest opportunity to grow your income. Some investors prefer to sign up for dividend reinvestment plans (DRiP) for their stocks. A DRiP basically reinvests any dividends received automatically back into partial shares of the same stock. Most brokers don’t charge any commissions or fees on these transactions, which can really help new investors build their portfolio. There are some drawbacks to DRiP though and I have even written about certain situations where there are fees. And these fee’s don’t make it worthwhile to DRiP. Also, if you use one of the free commission brokers like LOYAL3 and Robinhood – neither offer DRiP. This is actually okay though. Even if you don’t sign up for dividend reinvestment plans, you can still let your dividends build up and then reinvest. And that is exactly what we do with Robinhood and LOYAL3. Remember they don’t charge commissions … so a $10 investment is possible. So regardless if you DRiP or reinvest your dividend income on your own … it is still important to recycle your money back into more assets – in this case stocks. As you are building your portfolio and future income stream (along with increasing your net worth) – it is important to allow your money to work for you. And reinvesting your dividend income is the perfect opportunity to follow this plan. As you reinvest your dividend income … it only means that your future dividend income will likely grow to. Reinvesting your dividends into more shares of stock is an easy opportunity to grow your dividend income. We already covered the easy ways to grow your dividend income. The first is that you can simply sit back and wait for companies to raise their dividends – hopefully every year. The second way is to make sure you reinvest all of your dividend income into more shares of stock. This is especially important as you are building your portfolio. Both of these opportunities to grow dividend income are easy and don’t take a ton of work to maintain. As long as you pick good stocks to start with … you can basically set these 2 steps on autopilot. The harder way to grow dividend income is from new investment dollars. Now I don’t mean “hard” in the sense of doing heavy lifting work leaving you exhausted. In terms of investing new money into the market – it can be difficult or “hard” to find the funds. It takes discipline and sacrifice to invest new money … but it is possible. So the hard part is finding the funds to invest. For example, we have a plan to invest $20,000 in new money by the end of next year. Will it be easy? No. But it will certainly be worth it. Assuming we can invest that $20,000, we will have raised our future dividend income by almost $1,000! And the beauty is that if we follow our rule for reinvesting, that $1,000 will grow even more next year. The best opportunity investors have to truly grow their dividend income at first is from new investment dollars. Investors have 3 ways that they can grow their dividend income. First, if you invest in companies with a strong dividend history … there is a great chance your income will grow every year. The hardest part about this is the initial research. Second, if you are in the allocation phase of building your portfolio – you MUST put your dividend income to work. Reinvest those dividends! Finally, the biggest rise in dividend growth when you are first starting out will be from new investment dollars. We have a plan to pump in another $20,000 over the next year to accelerate our dividend income potential. Which of the 3 ways to grow dividend income do you use? Or if you are just starting out – do you plan to use all 3?